Before. This is the before. Before the infamous Wendy, there was Tiger Lily. This is her story.3.5 stars. Expect the unexpected. This is not Peter Pan as you know it. This is Tiger Lily as seen through the eyes of Tinker Bell. At first, I wasn't sure what to make of a story being told about one person while using the voice of another person (okay, little flying pixie bug thingamajig). It took me several chapters to warm up to the style of writing. I couldn't get past the fact that Tink was flying around and following Tiger Lily, simply describing the daily events as they unfolded. The writing style was intricate, if a bit too contemplative. 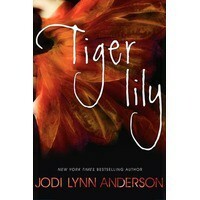 Fans of books such as Shiver will appreciate the concept of Tiger Lily. Subtlety through world and character description is the strength of writing here. If you're looking for a swashbuckling romp, this book might not work for you. This story moves forward in a subtle wave, picking up details of the surroundings as it progresses. Charming phrases and insightful observations make for an almost lulling read at times, even when things become dark.Adventure book this is not. While quiet and informative - often detailed and poetic - there was definitely nothing that would conjure up crazy mental images of pixie dust and nighttime flights. I do admit that I found myself wondering and waiting for the adventures of the Lost Boys and Hook's crew, which never really came into play the way I'd hoped.If you understand this, you'll appreciate the book more. For some reason, my only picture of Tiger Lily is of a cartoon version with a scowl on her face. In this retelling, she is still a bit wary on the outside, but seen through Tink's eyes, she also has a lot of grit and heart. My favorite characters were flipped on me. I have NEVER liked Tink in any version of Peter Pan that I've come across. She was so endearing in this book. I managed to fall in love with Tink and hate Wendy (I hope my friend Wendy Darling does not see this, it's nothing personal!). Oh man, I wanted to rip prissy little Wendy's curls right out of her head. I wanted to scream at Peter for being so enamored of her. Tink's love for both Peter and Tiger Lily was heartbreakingly sweet to watch. One tiny little sprite loved and wanted a boy who couldn't love her back, so she did what she could to take care of both him and the girl that he loved.I confess. I flew back to the burrow on secret, nightly visits. I watched Peter and the boys. I nestled behind Peter's ear one night while he slept. I lay on his chest and listened to him breathe. I wanted to be close to him and smell him and hear his heartbeat.I wanted to be there, having my face touched, defeating a heart like Peter's, but the next best thing was seeing it for Tiger Lily.I don't know how I feel about Peter being shown as a viable "man" conquest. His youthfulness in this tale was almost seen as a sweet aspect, in the way that an adolescent growing into himself is learning how to charm the ladies. For some reason, he came across as far more capable than how I'd pictured Peter in the past. Wendy was more of a mother to the other lost boys than she was to Peter. I guess the point was made that Peter was more of an equal in this book, especially with the direction that the story headed in.Who should read this book? Anyone who appreciates a story where the strength is in the telling, not the showing. I admit that I generally prefer a book which has more "stuff" going on. I get restless, especially when we're several chapters in and nothing has happened other than one person's life being described, down to the every single side character in the village. This isn't normally the style of writing that I prefer. However, I think the journey won me over in the end. The last 25% of the book was beautiful to witness.Would I read it again? Nah. Once was more than enough.